BandHelper builds on the repertoire functionality of Set List Maker, adding functions to manage your band's schedule and finances. BandHelper can also sync data between devices automatically, and includes a web interface to update data from your computer. When you select a show from the Shows list, you will see the layouts that match your device's screen size and orientation. You can select a layout to view the show, or rotate your device to see the layouts that match the other orientation. To use a different layout, tap the back button in the top left corner of the screen, then select another layout from the list. You can also cycle through your layouts using a remote control action. If for some reason your device doesn't show these predefined layouts, or only shows some of them, you can reload them by tapping Help > Utilities > Load Default Layouts. This won't affect any layouts you do have. Some layout items have an options button in the top right corner. The options button on a song list allows you to control several aspects of the list display, like text size, song buttons and song fields. The options button on a text field allows you to set a color for the field or show a label with the field's name. When resizing layout items, you can generally resize them to any proportion, but to return to the default proportion, you can double-tap the bottom right corner. To move a number of layout items as a group, you can drag a selection area starting from an empty area of the layout and encompassing the desired items. You can then drag any item to move them together. To add items to your layout, you can tap an empty area of the layout, then select a new item from the list that appears. If you add a song list to your layout, it will always appear below the other items while editing, but it will always appear above the other items while viewing. This allows you to create a layout where you can hide or show the song list using one of the Song List buttons in your layout, or using a layout action, or using a remote control action. If an item is selected for editing but you want to select an item behind it, you can click its options button and select Move To Back. If you want to place an item on top another item, such as a button on top the document viewer, you can click the exiting item's options button and select Add Overlapping Item. You can also customize the bottom toolbar by tapping an info field, then selecting a new field name from the list that appears. If you place any +1 or +2 items (which display info for the next song or the song after that) on the right side of the toolbar, Set List Maker will move those fields to the right side of the screen. You can the Song Edit, Layout Edit, Quick Add or Random Song buttons to the bottom toolbar by selecting your layout from the Layouts list and then tapping Edit Details. These buttons provide immediate access to some functions without leaving the set list view, but take up space in the bottom toolbar that you can reclaim by turning them off if you aren't using them. 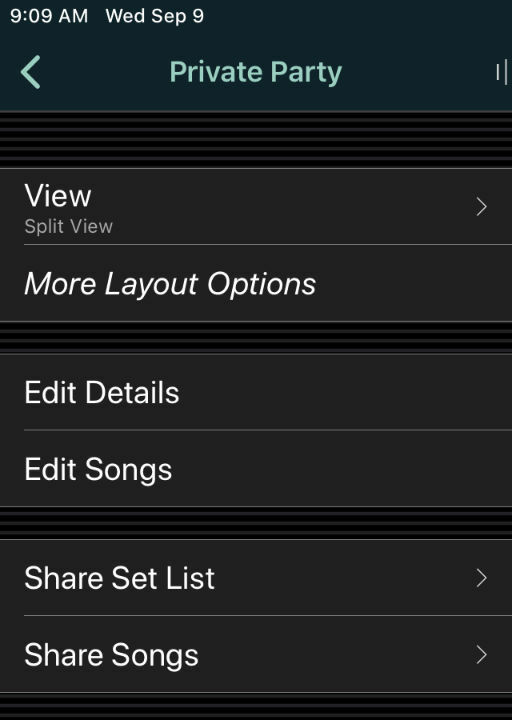 You can turn on song selection and completion actions for a layout by selecting it from the Layouts list and then tapping Edit Details. See the Layout Actions section below for more info. You can create a new layout from scratch by tapping the + button at the top of the Layouts list, or create a new layout based on an existing layout by selecting a layout, tapping Edit Details and tapping the Copy button. If you copy a layout that was created with a different screen size, the copy function will prompt you to choose between scaling the layout to the current screen size, or keeping the original size. You will probably have to make some sizing adjustments to the new layout in either case. By default, layouts will only be available to view on devices with the same screen size and orientation with which the layout was created. But if you turn on Scalable on the Edit Details page, the layout will be available on devices with the same orientation, and will scale to fit different screen sizes. This allows you to maintain a single layout for use across different device models. However, due to variations in screen aspect ratios, the layout might not use the full width or height of some screens. On the Edit Details page, you can rename a layout by entering a new name, or delete it by tapping the Delete button. The Song List will display the songs in the set list as a scrollable list. It will always appear above the other items, so you can place the song list on top of other items and then show it temporarily when you want to select a new song. The options button on the song list leads to several options for controlling the display of the song list, such as text size, song buttons and song fields. 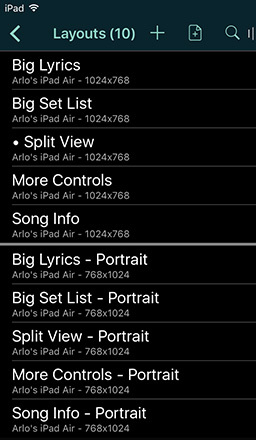 The Song List - Split View and Song List - Full Screen buttons allow you to show a song list that was added to your layout but hidden. These buttons only work if the layout contains a song list. The Song List - Split View button will show the song list at the size you chose when adding it to your layout, while the Song List - Full Screen button will show the song list at the full screen size regardless of its size in the layout. You can hide a song list by tapping one of the song list buttons again, or selecting a song with the Hide Song List layout action set to Song Selection, or using the Hide Song List remote control action. The Document Viewer will display a song's attached documents, chords and lyrics or video. It will always appear below the other items, so you can place items on top of the document viewer if you wish. In this case, those items will be displayed with a semi-opaque background for better contrast against the document content. From its options button, you can set the document viewer to display in one or two columns. The Notes field places resizable and scrollable text onto your layout. You can pinch in or out to resize the notes text, and tap the tools button to show a menu with options to save or reset the text size. The Document Button, Recording Button and MIDI Button will access the default document, recording or MIDI preset for a song when you tap it, but you can also tap and hold it to show a menu providing access to all the attached documents, recordings or MIDI presets. 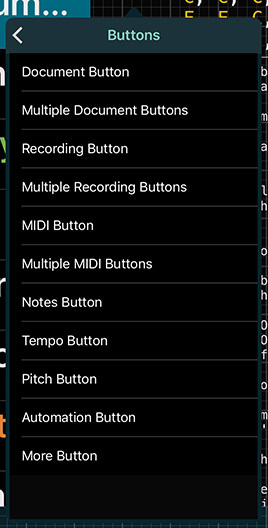 The Multiple Document Buttons, Multiple Recording Buttons and Multiple MIDI Buttons will show a separate button for each document, recording or MIDI preset attached to a song. You can resize these items to lay out the buttons horizontally or vertically. If a song has more buttons than fit into the size you designated, the list of buttons will be scrollable. The Page Buttons will display a button for each page of the current document or lyrics. You can resize this item to lay out the buttons horizontally or vertically. The Recording Controls include a top row with play/pause buttons, next/previous buttons, a progress slider and a timer, and a bottom row with loop buttons and a speed control slider. If you only need the top row, you can resize this item to hide the bottom row. The Master Volume includes a slider to control the output volume of all Set List Maker's audio. If you enlarge this layout item, or scroll within it, you will see additional sliders to control the separate volumes for recordings, videos, tempos and starting pitches. You can orient the sliders horizontally or vertically depending on how you size this layout item. The Box and Line items allow you to add simple design elements to organize your layout. Boxes always appear as a background behind other items, and lines can be either horizontal or vertical depending on how you size them. Song Selection: This trigger is fired when you select a song, either by tapping its name in the song list, swiping between songs, using the Next/Previous buttons to change songs, using a foot switch or other remote control device, or auto-advancing with the Select Next Song layout action. Song Second Selection: This trigger is fired when you select the same song twice. This allows you to select a song once to view it, then select it again to trigger some actions. Or you can trigger some actions on the first selection and trigger other actions on the second selection. For example, you might want to send your MIDI presets immediately on the first selection, then look at the song for a moment before selecting it again to start a backing track. Two-fingered tap: This trigger is fired when you tap with two fingers anywhere on the screen. This generally requires less accuracy than tapping a button, so you can use it to trigger any functions that you need to access quickly during a performance. Three-fingered tap: This is similar to the two-fingered tap, and allows you to access additional functions by tapping three fingers. Song completion: This trigger is fired when a song's recording or automation track ends (whichever is later), or when the song duration is reached, if the song doesn't use a recording or backing track. You can use this to "clean up" after a song by stopping a tempo click, closing a full-screen document or opening a song list, or to trigger the Select Next Song action to auto-play through your set list. Since layouts are typically personalized for each user, they are not included in database exports. However, you can share them manually via email. When viewing a layout you want to share, tap the Layout button and select the Email option. A new email message will appear, with the layout attached as a text file. You can address and send this message. To import a shared layout on iOS, tap the Layout button and select the Import option, then select the layout file from a compatible app. Or select the layout in a different app and use the Open In feature to copy it into Set List Maker. To import a shared layout on Android, tap the Layout button and select the Import option, then select the layout file from a folder on your device. Set List Maker will add the selected layout to your Layouts list. Set List Maker will not import layouts that were saved on a device with a different screen size. Set List Maker is © 2010-2019 Arlo Leach. The Set List Maker name is a registered trademark.